Recent reading led me to see if I could find a usable, affordable Ford Mustang. However, it appears that as we approach the 50th anniversary of the Mustang, the slightly mangy but affordable ones are gradually disappearing, leaving complete projects, nice drivers, and beyond. So what to do? AMC AMXs or Javelins might be cheaper, but unfortunately hard to find. Maybe an average sedan with a powerful engine, like a Nova? Guess again, it appears most anything beyond a basket case is over $4000. And then I realized I’d forgotten the Ford Falcon (approved by 9 out of 10 Argentinean government spooks!). The Mustang’s more dowdy older sister, the years have been kind to it and it now looks like a tidy little compact sedan. 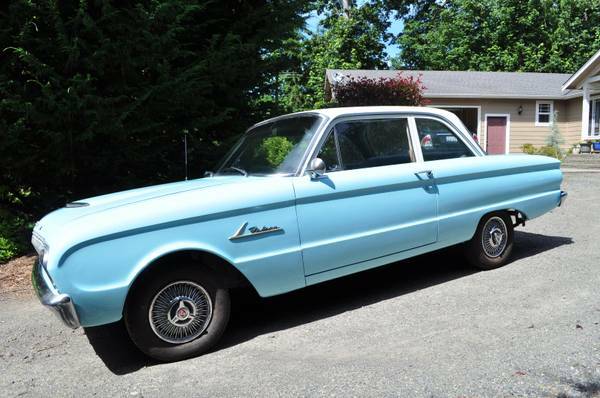 Save yourself some time poring through all kinds of listings and reach out to the seller of this 1962 Falcon two-door, listed at $3900 (still not cheap!) in Port Orchard, WA, just west of Seattle. Looks pretty in pale blue, and these spoke hubcaps work really well on it. Together with the faux hood scoop and the badging, it actually looks a little sporty, if not quite as sporty as the sprint. Compared to the others out there, this car seems really well treated for the asking price. Both the current owner of eight years and the former owner kept it in their garages, so although there’s no mention of rust, this and the fact nothing shows on the light blue color give hope for a rust-free car. Seller says everything is in good shape, and the interior certainly supports that. Apparently the radio even works, although I would expect an AM radio. How do you feel about sports & talk? 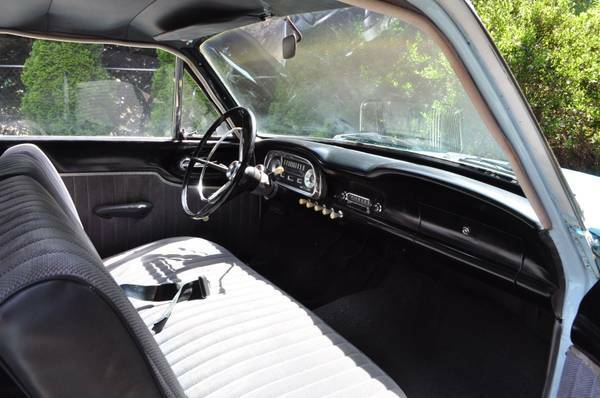 What a nice, simple interior – could a modern car not carry this theme? The Honda S2000 pulled it off successfully a few years back. The rear is nice too. Who was BMW looking at when they designed the round tail lights on the 2002? 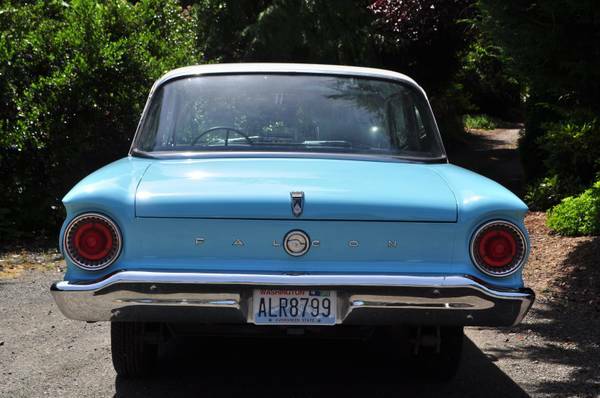 A Falcon, Galaxie, Cortina, or something else? There’s no picture of the 170ci six, which is mated to a three-on-the-tree manual, but it could be fun to find out what the popular modifications are and try them out. And unless shifting is really painful, there’s no point saving the 3-speed C4 that comes with the car. This entry was posted on August 3, 2013 at 6:00 am and is filed under Feature. You can follow any responses to this entry through the RSS 2.0 feed. You can leave a response, or trackback from your own site.